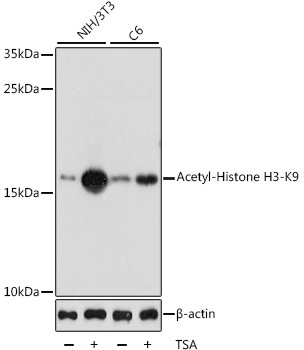 WB analysis of Histone H3K9ac (Acetyl H3K9) Polyclonal Antibody. Western blot analysis of extracts of various cell lines, using Histone H3K14ac (Acetyl H3K14) Polyclonal Antibody. Western blot analysis of extracts of various cell lines, using Histone H3K18ac (Acetyl H3K18) Polyclonal Antibody. 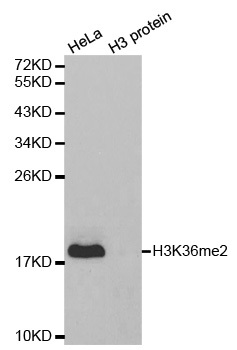 Western blot analysis of extracts of various cell lines, using Histone H3K27ac (Acetyl H3K27) Polyclonal Antibody.